The most popular among of my 135 blog posts so far on this website is from 2012: "Covering the Student Cover Letter." Scores of students who have sat in my office or classroom have followed its advice. So, too, have many students from around the nation who come across it during my presentations about digital branding or by social media or even word of mouth. My goal here is to update that prior blog post about crafting cover letters with a few more tips. Word to the wise: The fundamentals for this exercise are in the blog post referenced and hyperlinked above. This is Part II. Read Part I first. Don't get it twisted. Consistent letterhead and proper file naming. The cover letter letterhead prescribed in Part I's third paragraph should match what is atop your resume. Both documents should look like they came from the same person. Ensure they are named smartly: lastname_coverletter.pdf, lastname_resume.pdf. Remember that most recruiters typically get many applications. You want yours to be found easily if searched for electronically. Make great use of transition (or topic) sentences. Good, effective writing is a sure way to getting the position. Begin each paragraph strong and with clarity about what's coming next. Avoid using dependent clauses (especially to begin a paragraph, but also otherwise). Limit your transition sentences to one line on the page; do your best to keep all sentences in the letter from being more than two lines long. Write tightly. Remember why you need a cover letter. I once heard recruiting guru Joe Grimm tell a group of journalism students that a resume is for sharing the who, what, where and when with respect to your experience. The cover letter, he said, is for the why and how. In other words, why did you go after that amazing story? What challenges did you overcome? What did you learn from the experience? Show that you're acting and thinking like a journalist. Leave judgments to the recruiters. Avoid sentences that proclaim you as the best thing ever or don't separate you from competitors: "I believe I am the best candidate for this position because ..." or "I have always been a self-motivated student who strives to meet and exceed my goals and works well with others." Don't all college students believe in themselves or work hard? These sentences appear in letters from inexperienced applicants or those unable to better express what experience they do have. Having grown up with the opportunity to attend multiple Brewers game per season, once even being a season ticket holder, I understand how the organization has garnered its success. The atmosphere of Miller Park is one to be reckoned with. Baseball games bring strangers together. They bond over the team, the culture and everything else that makes them proud to be there. You don’t go to a Brewers game with just your friends. You go with every fan surrounding you. As a journalism major, I love to interact with those in the community by sharing the feel-good stories that bring people together. Now, I want to give Brewers fans the same opportunities I so graciously encountered. Not only is it well written – I love the short sentences – it screams she gets it. Of course, her resume needs to be just as good. But it wouldn't surprise me if this paragraph alone helps her to get the interview. That's the goal, isn't it? Getting an interview? My hope is that my two blog posts on student cover letters – Part I before and Part II here – help you get yours. Good luck. Our own evaluation of the performance of traditional and social media in the Ferguson story is mixed. News consumers have had access to great reporting and predictable, tablet-thin coverage, as well as to a powerful social-media movement that has roiled the Twittersphere with posts both smart and stupid. Twitter and the news media will be intertwined for some time as the story in Ferguson and related police shootings and protests, in New York and elsewhere nationwide, continue to be broadcast via hashtags. ... What follows relates to how, in a sense, and even if unintentionally, traditional and social media worked together to report what happened in Ferguson. We will first address Twitter’s most salient contributions, then traditional media’s, and then similarities between the two. Christian and I met at the inaugural Teachapalooza conference for journalism educators in 2011. She's a former staff reporter for the Chicago Tribune, author of "Overcoming Bias: A Journalist's Guide to Culture and Context" and an associate professor of journalism at Western Michigan University. So when Christian emailed me in August about looking together at mainstream media's coverage of the Michael Brown case, well, it was yes at hello. That Zeteo might publish our work with #Ferguson still timely and, as she also wrote, it would give educators some tools for talking about the matter in their classes all seemed worthwhile. My key concern was fairly contributing to the collaboration given my returning that same week to teaching for the first time in a year – and in the coming weeks having to facilitate the second annual O'Brien Fellowship in Public Service Journalism conference, keynote a NAACP banquet in Illinois and do a presentation on digital branding at the University of Wisconsin-Parkside. Thankfully, Christian and the Zeteo editors were very patient and helpful. I learned a great deal through the process and hope to work with my co-author and the editors again soon. Did I say this is my second journal article? Here's a blog post about the first one, "An Online Hoax Reminds Journalists to Do Their Duty," published in the "Journal of Mass Media Ethics" in 2012. With these academic works and my graduate school thesis now behind me, I am looking forward to my next opportunity to do something scholarly. What and when will it be? 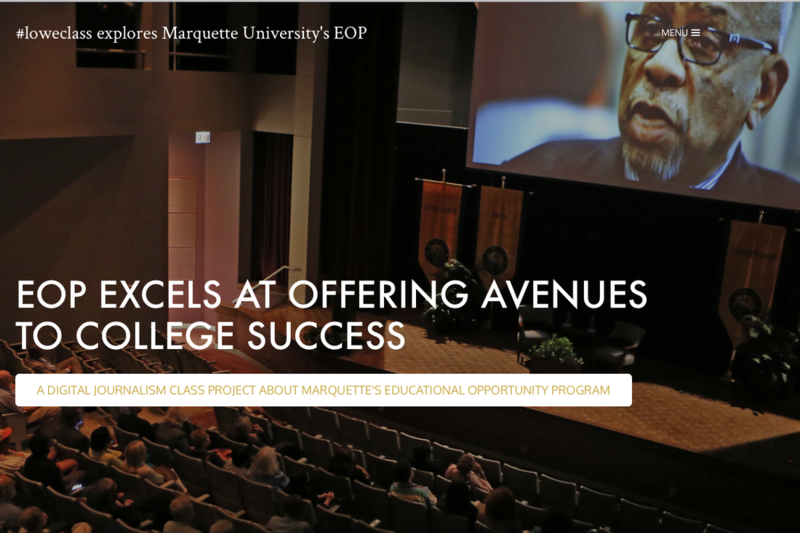 What's in this blog post is also published as the About page on a new website – "EOP Excels at Offering Avenues to College Students: A Digital Journalism Class Project About Marquette's Educational Opportunity Program" – found at loweclass-mueop.weebly.com. The work of my journalism students this semester was first conceived when Joseph Green, Ph.D., appeared at a board meeting of the Marquette University Ethnic Alumni Association (EAA) in 2010. Green had recently become director of the university's Educational Opportunity Program (EOP) and said that one of his priorities was finding ways to capture and present its legacy and activities. To my surprise, everyone around the table immediately looked to me. As a proud Marquette and EOP graduate, I left that EAA meeting eager to help Green and others tell the program's story and those of its nearly 2,000 graduates. As a new faculty member, the possibilities for student journalists to contribute were obvious. Four years later, EOP's 45th anniversary celebration coincided nicely with my desire for a worthwhile final project for my Digital Journalism III (JOUR 2100) class. Also known as #loweclass, my 14 students plus one joining us via an independent study readily took to the idea, as junior Natalie Ragusin shares in an introduction that includes excerpts from blog posts written after all but a couple learned that EOP existed. Several of them later attended a symposium focusing on events that caused Marquette to start EOP in 1969. Junior Henry Greening recounts the symposium using excerpts from blog posts written afterward. Elizabeth Baker offers a story about EOP founding director Arnold Mitchem, Ph.D., considering his life's work, after the junior reviewed a DVD of my half-hour interview with him after Marquette premiered a documentary about the program during alumni reunion weekend in July. Junior Madeline Kennedy and senior Robyn St. John worked together to create a photo gallery featuring the best from among scores of images taken at EOP events during that weekend. Teaching students to use video as journalists is one of JOUR 2100's primary goals. Sophomore Brittany Carloni and seniors Thomas Conroy and Madeline Pieschel produced a video about the tutoring service EOP provides for undergraduates. Juniors Jenna Ebbers, Estefania Ebbers and Caroline Roers offer one about the program moving its offices to elsewhere on campus. After most of the class had reviewed unused footage from the before-mentioned documentary, Baker, Greening and Ragusin teamed with juniors DeWayne Gage and Teran Powell to present personal reflections from six people linked to EOP. This final project also includes interactive storytelling and basic data visualization. Sophomore Devi Shastri and Junior Roque Redondo (with copyediting by Baker) developed a timeline that reviews EOP's history and efforts in Milwaukee and nationally to provide better higher education opportunities for students of color. Several of the students also joined to create illustrations based on program-related data provided by EOP officials and discovered using other sources. #loweclass considered lots of options for sharing all of this work. We hope it will soon find its way onto Marquette's website alongside existing content showcasing EOP. For now, my thanks to Kennedy and Pieschel for coming into my office on a Sunday afternoon to help me fashion this site a day before Greene and others examined it during our final exam period. "It's incredibly impressive," EOP Administrative Coordinator Claire Dinkelman, our main contact for both securing data and access to her colleagues, told the class. "It's so comprehensive. It's not just a film. It's all these other little pieces together." University Archivist Michelle Sweetser, who worked with Shastri to locate material for the timeline, brought along others from Raynor Memorial Libraries for the unveiling. “It’s really great to see the work that you have put together," she said, adding "you have created a new entry, basically, in the scholarly world ... about the EOP program. You’ve created this great resource." Green also congratulated #loweclass for its efforts. "This is fabulous. I want to thank you all ... for this work – and I really believe (that) this is going to be really impactful nationwide in terms of capturing what we do in TRIO (the set of federally funded college opportunity programs begun during President Lyndon Johnson's War on Poverty in the 1960s)." My sentiments would echo what Green, Sweetser and Dinkelman said. So let me end with a new #loweclass signature from this semester: #soproud. Thankful to @herbertlowe and my fellow members of #loweclass for a semester of great #journalism experiences. A screenshot from the Cleveland.com webpage focusing on the coverage of SI's reporting James' decision. "I absolutely want to use this article in a way to teach my journalism students how it is you can develop sources, why it's important to develop sources, why it's important to develop trust, not only with your sources but with your editors," Lowe said. Lowe was unequivocal in his praise for the manner in which SI and Jenkins handled James' news: "Journalism is telling stories about people who matter to lots of people and providing an audience with news that is compelling and factual. This is all of that in abundance." Wolfley noted in an earlier version that I also said no one questioned SI allowing a first-person approach when NBA player Jason Collins revealed he is gay last year; Collins bylined that essay whereas Jenkins interviewed James and then crafted it as James telling it to him. Wolfley also wrote in his earlier version that I had once used the same approach as a young reporter. I was working at The Virginian-Pilot in the early '90s and profiling a commonwealth's attorney becoming a judge. Upon seeing that I had written it in the form of a letter from the very public official to his absent father, my editor made me call the attorney and read it to him word for word. The attorney stopped me after a few paragraphs. He said he trusted me. He would be fine reading it the next day in the newspaper at the same time that everyone else did. Not all my colleagues at the time supported the first-person approach. Certainly, not everyone else agrees with SI's decision to essentially allow James the chance to tell his own story -- and very much so better than the basketball great did with "The Decision" on ESPN fours years ago. The other three "experts" cited in Wolfley's column are definitely not unequivocal with praise for SI's decision making, so much so I seem like a cheerleader by comparison. Be that as it may, here's more good reading on the matter from Sports Illustrated itself as well as The Wall Street Journal, Advertising Age, Deadspin and The Plain Dealer in Cleveland. As I told Wolfley, this will all make for great classroom discussion and teachable moments for me and my students.